GroundED is a quarterly newsletter sent out to thousands of design professionals throughout North America. 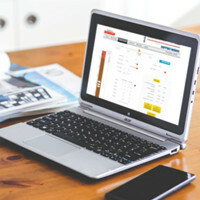 Each newsletter features a lead article written by one of the engineers or product experts at Supportworks, and also includes case studies from across the Supportworks contractor network. The case studies showcase use of the various foundation, retaining wall and slab support products offered by Supportworks. Sign up to start receiving your copy today! Helical anchors are tension-loaded steel elements used in a variety of applications, including tiebacks for earth retaining structures, guy-wire support for towers or other structures, and tie downs for wind/uplift loading, seismic restraint and buoyancy control. Supportworks, Inc. celebrated a major milestone by moving into its new national headquarters in June-just two months after celebrating its 10-year anniversary. 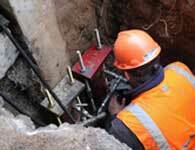 Often the engineers at Supportworks will make recommendations for shaft sizes of helical piles and push piers based on the pile buckling potential. Helical Pile Capacity: It has been our experience that most design professionals utilize the individual bearing method in calculating the end bearing capacity of a helical pile. Building products are commonly evaluated by third-party evaluation services to show compliance to existing building codes. These evaluations are particularly useful for code officials and design professionals to verify suitability of a manufactured product for a building project. Helical soil nails are a relatively new alternative to grouted soil nailing and differ from grouted tendons in how they develop resistance. Designers and manufacturers continue to provide push pier systems capable of ever-increasing load capacities and improved performance. This edition of GroundED summarizes the development of the push pier system and includes case studies of commercial applications by Supportworks dealers. 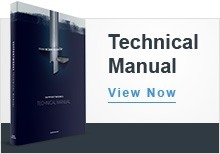 Our New Technical Manual Edition! Here at Supportworks, we strive to be constantly innovating, reinventing and improving our products, tools and services for the betterment of the contractors and design professionals we serve. 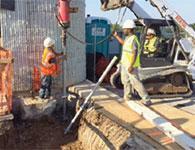 Supportworks' Model HP350 helical pile system has received compliance from the ICC Evaluation Service, LLC (ICC-ES). 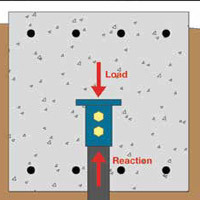 Here at Supportworks, we continually strive to better educate engineers and design professionals on the unique foundation stabilization solutions we offer. 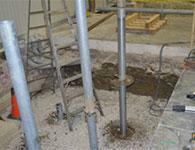 Don't "Push" Square Bar Helical Piles! 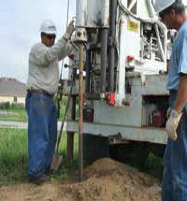 Solid square shaft helical piles were developed primarily as anchors in the utility industry for guying towers and poles. 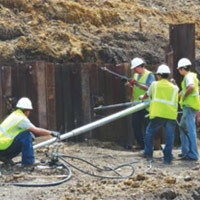 The eighth issue of this newsletter (Summer 2011) included a discussion of the three most common methods used to predict helical pile capacity. HelixPro® 2.0 - Updates for 2015! 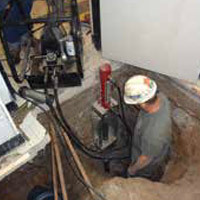 Helical piles and tiebacks are installed with hydraulic drive heads that rotate the product into the ground by the application of torque. Supportworks® is pleased to announce the issuance of evaluation report ER-289 by the IAPMO Uniform Evaluation Service (UES). 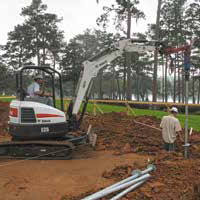 Helical piles can be installed in areas of limited access with smaller equipment, yet achieve relatively high capacities. 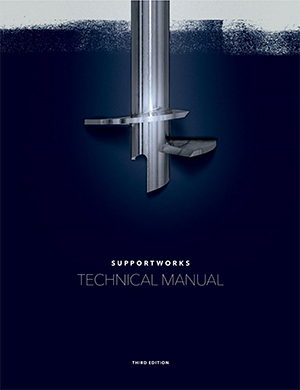 The Supportworks, Inc. (Supportworks) technical manual received a major overhaul for 2014. 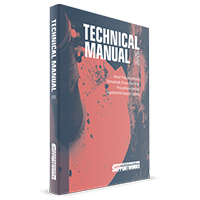 The new 363-page, softcover manual is literally hot off the presses, with nearly 3,000 ordered by the Supportworks network of installing contractors the very first week it was offered. 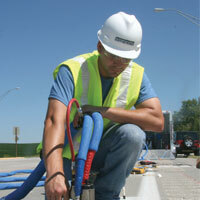 The Supportworks (Supportworks) PolyLevel® System is a two-part urethane polymer that expands into rigid, structural foam to fill voids, stabilize and lift concrete, and offer solutions to a wide range of geotechnical and structural applications. 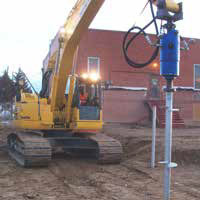 Both retrofit helical piers and hydraulically-driven push piers can be used to stabilize settled structures or support additional loads transferred toexisting foundations. But are there conditions where one system may be a better fit over the other? 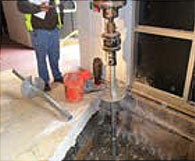 You discovered that your project requires a deep foundation to provide adequate structural support. 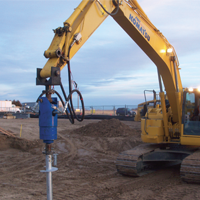 You also suspect based on the design loads and soil conditions, coupled with limited equipment access, high groundwater, contaminated soil, tight construction schedule, or just economy that helical piles could be the ideal solution. Now what? 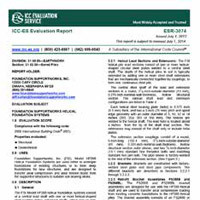 Supportworks® is pleased to announce the issuance of evaluation report ESR-3074 by the ICC Evaluation Service (ICCES). 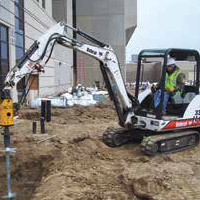 Even smaller diameter helical piles can develop relatively high capacities, yet be installed with hand held equipment and smaller machines such as mini-excavators and skid steers. 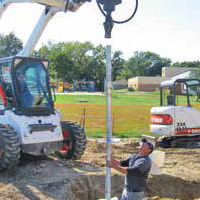 Design professionals are becoming confident with utilizing helical piers on their retrofit foundation stabilization or repair projects. 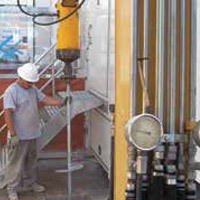 The torque correlation method is a well-documented and accepted method for estimating or verifying helical pile capacity. 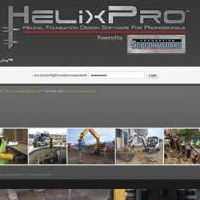 HelixPro™ - Helical Foundation Design Software for Professionals" was released on September 4, 2012 after nearly a year of design, development and programming efforts. 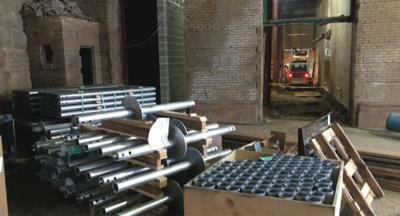 Supportworks addresses the issue of retrofit helical pier eccentricities in one of two ways. 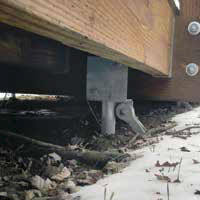 The first is to increase the stiffness of the pier system itself, allowing it to resist more of the eccentricity. This is accomplished by incorporating an external sleeve to resist the bending forces. 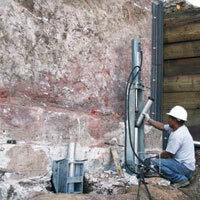 The projects represented by all four case studies in this issue of Foundation Nation were completed within the state of Florida where helical piles have become a popular deep foundation alternative for both retrofit and new construction applications. 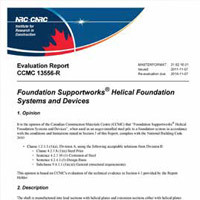 On November 7, 2011, Supportworks®, Inc. received an evaluation report through the Canadian Construction Materials Centre (CCMC) for "Supportworks® Helical Foundation Systems and Devices"
Design professionals rely on site-specific geotechnical investigations to provide soil strength parameters for use in foundation design. 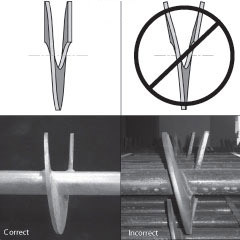 There are three common methods for predicting helical pile capacity; the individual bearing method, the cylindrical shear method and the torque correlation method. 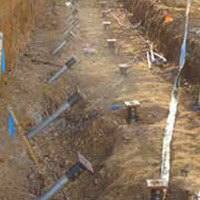 Soil nailing is a method of earth retention that relies on a grid of individual reinforcing strands or members installed within a soil mass to create an internally stable gravity wall/retaining system. The term "corrosion" is used to describe the degradation of a material or its properties due to reaction with its environment. The coupler detail is yet another extremely important feature when considering helical piles and when selecting or specifying a product manufacturer. 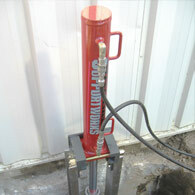 Manufacturersmay advertise that they carry the same or equivalent helical shaft. 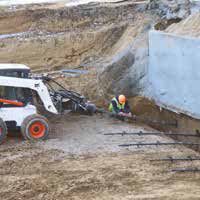 Many designers view helical foundation systems with some degree of skepticism as a fairly new technology, especially in applications such as deep foundation support for a structure. 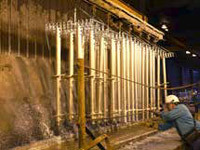 The initial installation of a helical pile is performed by applying a downward force (crowd) and rotating the pile into the earth via the helix plates; a.k.a, helix blades or helix flights. We often receive phone calls from designers and specifiers asking whether a hollow round shaft or solid square bar helical pile would be better suited for a certain application. This appears to be a great opportunity to provide some clarity and offer our opinions and recommendations to the masses. Supportworks, Inc. (Supportworks) is a leading manufacturer and distributor of foundation stabilization systems for new construction applications, retrofit applications, walls and retaining walls. 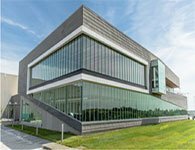 With major dealer support offices in Omaha, Nebraska and Seymour, Connecticut, our goal is to provide the industry with innovative solutions that are appropriately designed and tested, expertly installed and dependable to perform as promised.